Does My House Need A New Roof? With any home improvement project, it is essential to make certain that you are minimizing your costs and getting the most for your hard earned money. 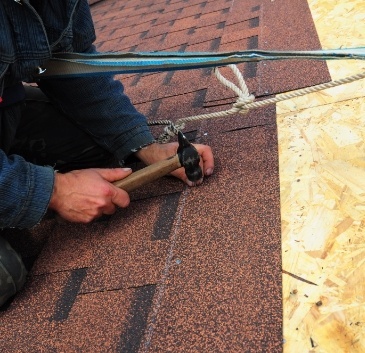 If you are considering a new roof, one of the first decisions your contractor should assist you with is whether or not your roof needs a simple patch up or replacement. Within this decision, there are obvious clues that you may need a new roof, such as leaking water, but most clues are much more subtle. Here is what to look for to help decide if you need a new roof. To be clear, shingles are one of the least-durable roofing materials. So over the years, it is quite possible that many of them may have curled, split, cracked, or are completely missing. While fixing a couple stray shingles here and there is relatively simple and inexpensive, if more than a quarter of the material is damaged a roof replacement is your most cost effective choice. Partial reroofs can create problems because all of the roofing layers must be removed to avoid an uneven and lopsided roof. Partial reroofs can increase labor costs because of this, so it is wise to choice the entire replacement if you need a partial reroof. The age of the material is a huge factor in your repair/replacement decision regardless if your roof is in perfect or fair condition. If you have an older roof that is nearing the expiration date, it might be wise to replace before any crisis occurs. The overall longevity of your roof depends heavily on the kind of material used and roofing shelf lives can vary greatly. Asphalt Shingles: Average life of 15-20 years, but newer and more advanced designs last up to 40 years. Metal or Aluminum: Due to metal’s ability to prevent warping or degradation, the average lifespan is 50 years or more. Clay or Concrete Tile: One of the most durable options, these options are basically impenetrable and last 35-50 years. Wood: Depending on the climate, wooden roofs have a lifespan of 15-30 years. Chances are that if your roof is more than 20 years old, then you are probably due for a roof replacement. Always make sure you know the age and condition of the roof before you buy a new home. Younger roofs can also fail, so make sure to check your roof at least once a year. Walk around your home and check for moisture marks. This may be anything from small brown stains to peeling paint. If you spot a moisture mark that leads to a small leak, a short-term repair is most likely all you need. However, if there is extensive damage to the roof or ceiling, such as mold or mildew growth, a full replacement is needed. Stains inside your attic are a good indication of a leaky roof. We suggest that you monitor these stains to see if they are a part of a large problem, like moldy or wet insulation due to bad shingles. If you ignore the water spots on your ceilings, you could have structural damage or mold problems in the future. If any of these factors have prompted you to decide to replace your entire roof, you now have a new set of decisions: should you install the new roof over the current one or should you rip off the old one first? A simple overlay decreases the cost because there is less labor involved; however, a full replacement has added benefits. Removing the first layer allows you to inspect the roof deck for any rotting or inadequate fasteners. Additionally, roofing materials hold better and longer if they are installed directly to the roof deck, which increases their durability.